I have successfully taken the 12 weeks dosage of Vita D advised by my physician after i went for a Vitamin D test. It was a self referral.Feeling much much better now. In fact within 3 weeks i was feeling comfortable and was also able to attend the 25th Reunion celebrations of my college and participated in all the events 🙂 . So glad i was able to make it. Before i started Vitamin D , I was also having intermittent pain on the right side of the abdomen. My physician said we will do an Ultra sound scan if the pain persists after a month . The pain has subsided after taking the supplements. I also had pain below the ribs after one month ie 4 weeks of Vitamin D tablets. When i mentioned the same to my Oncologist he had said that the pain could go away with the Vitamin D and that the ribs will take more time to heal. He was right and i don’t feel any pain now . I wasn’t able to sit all day at work and always wanted to lie down and go home early from work but now i am quite comfortable. My Physician had advised me to continue to take one Vitamin D tablet every 3 months after completion of the 12 weeks. Those little yellow chew-able tabs don’t seem to have any side effects too. I didn’t notice any. I haven’t yet done a test to check the current value of Vitamin D in my body. My suggestion to all is to do a Vitamin D test once in a year and based on the result, meet a physician and take their advise. I hope to spend some time in the sun from now on 🙂 . Everyone must and should spend some time in the sun everyday. However i do suffer from bouts of muscle cramps and toe spasms these days.The fingers on my feet get twisted often. Got to check why this occurs. 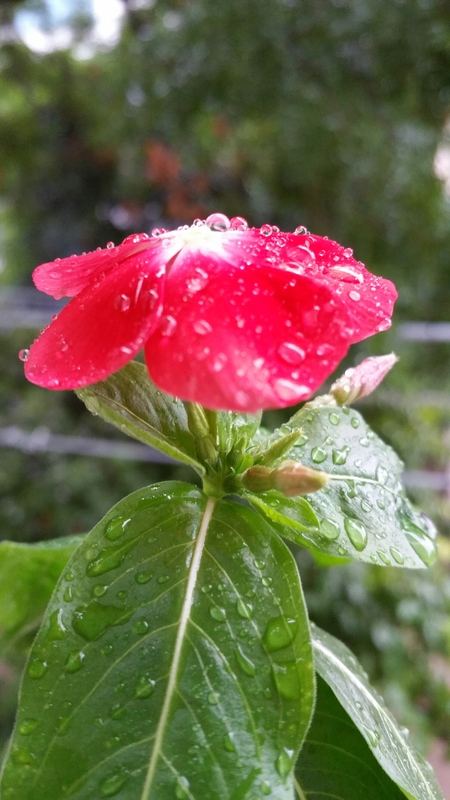 Here is a pic of a flower on my balcony which got drenched in the recent rain.